Your kid has it. He has that unmistakable spark, doesn't he? He has that determination to right the wrongs of the world. He has that sparkle of charm that lets him lead a group of superheroes against dangerous odds. You can even see a bit of Tony Stark's intellect in him. Maybe he likes to tinker with technology, or maybe he has some grand dreams of designing a super suit! Yes, he's a budding young genius and in a few years, you could see him facing off against the dastardly Thanos, couldn't you? Well, maybe there's a way to start preparing him right now. You can start getting him used to the Iron Man suit when you gear him up with one of our costumes based on the latest Marvel film, Avengers: Infinity War. This officially licensed Marvel Infinity War Iron Man costume is a deluxe costume for kids. It comes with a full-body jumpsuit. The exterior of the suit has printed armor details, including Iron Man's bright red armor pieces and plenty of gold accents. It even has a white printed reactor in the front of the chest. Attached boot covers let your child wear their favorite pair of shoes with the costume while still getting the full Avengers look. The final piece to the outfit comes in the form of the molded mask, which recreates Tony's newest helmet from the film. 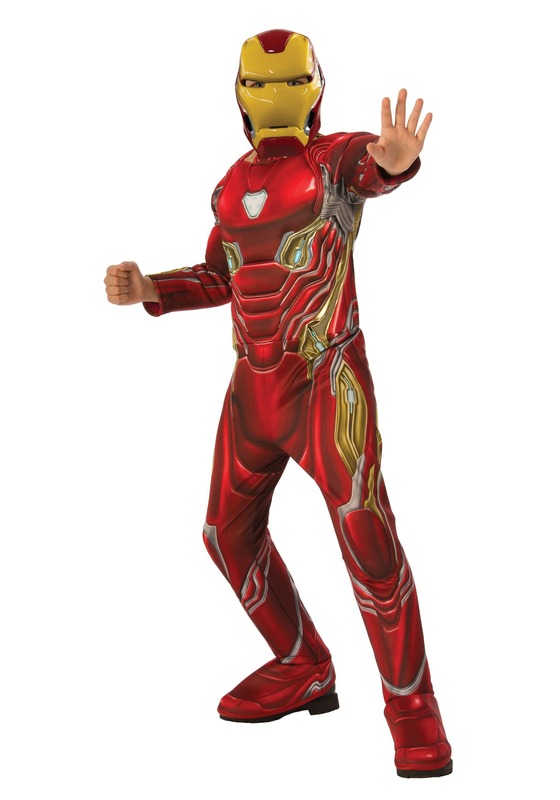 Once your young one is all equipped with this Iron Man costume, he might feel prepared for a rumble with Thanos. Just remember that this costume doesn't actually come with any of the superpowers seen in the movie, so you might want to tell your child to hold off on any duels with Thanos. Or at the very least, you might want to call up Spider-Man and Doctor Strange for a little backup. I really like the custome my grandson is going to love it. This is our third costume from Halloweencostumes.com and we love it. High quality. Fast delivery.